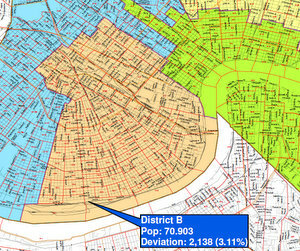 The New Orleans City Council comes to Uptown this week as part of a 10-stop neighborhood tour seeking public input on how council district lines should be redrawn following the 2010 Census. City Councilwoman Stacy Head’s District B runs from Audubon though a number of Uptown neighborhoods to Central City and the Central Business district. Its population fell at roughly the same rate as the city’s overall population since 2000, meaning the 70,903 people now living in District B are quite close to the target of 68,765 for each district, according to the new Census. The other four council districts are either well above or well below that target, however, so any change to District B is more likely to come as a result of making adjustments to the other districts work. Head already held the first of her District B meetings at a Canal Street church last week, during which residents were given maps of the district with precinct-by-precinct population counts so they could begin drawing an ideal shape for District B. Although those discussions are preliminary, Head said she believes that similar neighborhoods should be drawn together – grouping more suburban areas like New Orleans East and Lakeview separately from more historic neighborhoods like the French Quarter and Treme. This week’s meeting will be held at 6 p.m. Tuesday at the Nims Arts Center at the Academy of the Sacred Heart at 4301 St. Charles Ave.
Also in city government this week, the City Planning Commission will hear a handful of matters of interest to Uptown neighborhoods in a meeting slated for 1:30 p.m. Tuesday. A movie studio proposed by Joey K’s owner Sam Farnet for a Lower Garden District warehouse complex – which was heard but left undecided in March – is slated to receive a decision. The Housing Authority of New Orleans will request permission for a Subway sandwich shop to open at 501 St. Andrew Street in the Walmart complex (next to the GameStop) within the River Garden development. Finally, a hearing on changes requested by Whole Foods Arabella Station to its operating agreement with the city has been withdrawn while the store continues negotiating with the neighborhood. For full details and links to these meetings and other events in Uptown New Orleans, see our calendar listings below. Taize at Trinity Episcopal Church (weekly). 6 p.m., 1329 Jackson Avenue. Toastmaster’s Club 234 weekly meeting. 6 p.m., Latter Library, 5210 St Charles. Crescent City Farmers’ Market (Uptown). 9 a.m. – 1 p.m. (weekly), Tulane Square, corner of Leake and Broadway. New Parenting Group. 10:30 a.m. (weekly), Uptown Parenting Center, 938 Calhoun St.
City Planning Commission. Agenda includes a request for a fast food restaurant at 501 St. Andrew in the River Garden development; and a decision on a previously-postponed hearing over a proposed movie studio in the Lower Garden District. 1:30 p.m., City Planning Commission conference room, 1340 Poydras Street, Room 964. City Council District B redistricting meeting. 6 p.m., Academy of the Sacred Heart’s Nims Arts Center, 4301 St. Charles Ave.
And, of course, the New Orleans Hornets return to Los Angeles for Game 5 of the playoffs against the Lakers.